If you weren't already aware, winter in Westeros has finally arrived. To all Game of Thrones fans wondering where to watch the show's final season, we’ve got you covered. Wait out the realm's notoriously harsh winter in the warm confines of one of our city’s fine pubs over a few pints of beer... or mead if you prefer. The night before the big premier of Season 8, The Hop Project has offered to help us refresh our memories with a showing of Season 7’s epic finale on their big screen. It’s been a long wait, and we definitely don’t want to start Season 8 with missing pieces. Relive the action and get ready for Monday night over a drink or two. Apr 14, 7pm. The Hop Project, see event listing. 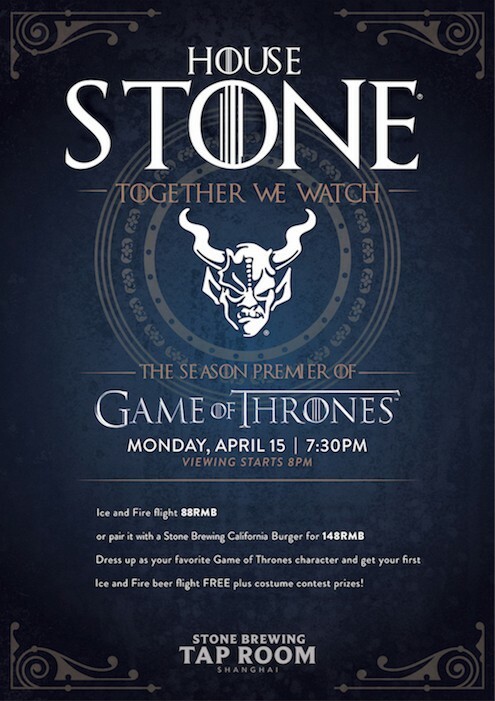 House Stone has risen to reclaim its rightful place on the Iron Throne, and Stone Brewing Tap Room is making sure no one misses out on the action. At 8pm sharp, they’ll be screening each new episode on the night of its release. Feast like the King of the North with a Tomahawk steak and receive a complementary Fire and Ice beer flight (usually RMB88). Dress up like your favorite Westeros character and get your first flight on the house (and possibly a prize or two). Mondays Apr 15 -20, 8pm. Stone Brewing Tap Room, see event listing. Spring is officially upon us, but winter is still coming! Just like last season, The Rooster is ready to provide your weekly fix of drinks, dragons and dwarves. 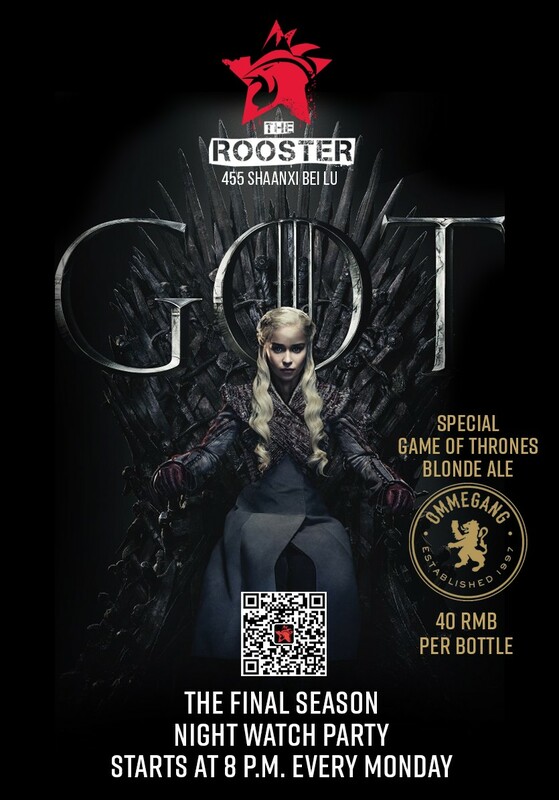 They’ll be serving up a special Game of Thrones Blonde Ale from New York's premiere craft beer joint, Brewery Ommegang, for RMB40 per bottle. It’s a blonde ale fitting for the House of Lannister itself. Mondays Apr 15 - May 20, 8pm. The Rooster, see event listing. 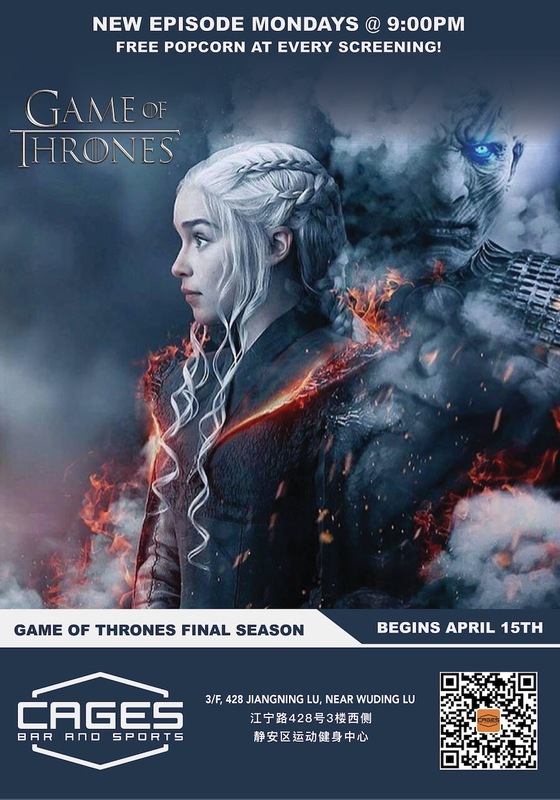 Cages are opening up their one-of-a-kind theater to all GoT fanatics starting April 15th for the premiere! 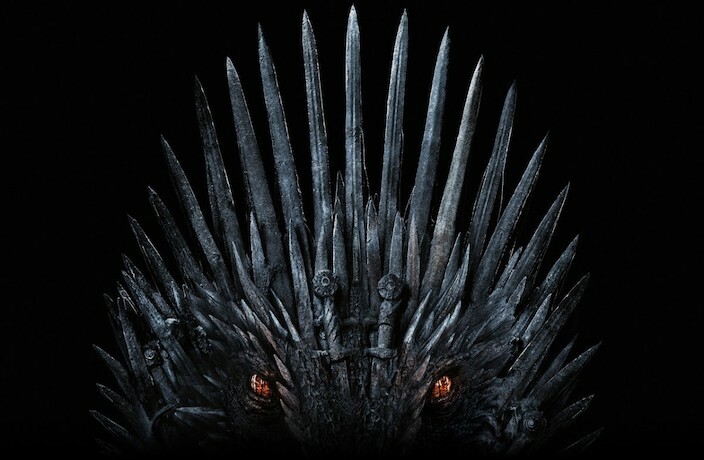 They've got a feast worthy of King's Landing (whole roast suckling pig, honey thyme glazed carrots, garlic mushrooms, bacon fat fried potatoes, beer bread and four one-liter steins of lager) planned for the season eight opener. It is only RMB888 for a set large enough for a dragon or four-six hungry contenders to the Iron Throne, but you'll have to pre-order. For every episode after that, there's free popcorn on offer. And if you fall behind, just show up at 7.30pm to screen the previous week's episode. Mondays April 15 - May 20, 9pm. Cages Bar & Sports, see event listing. 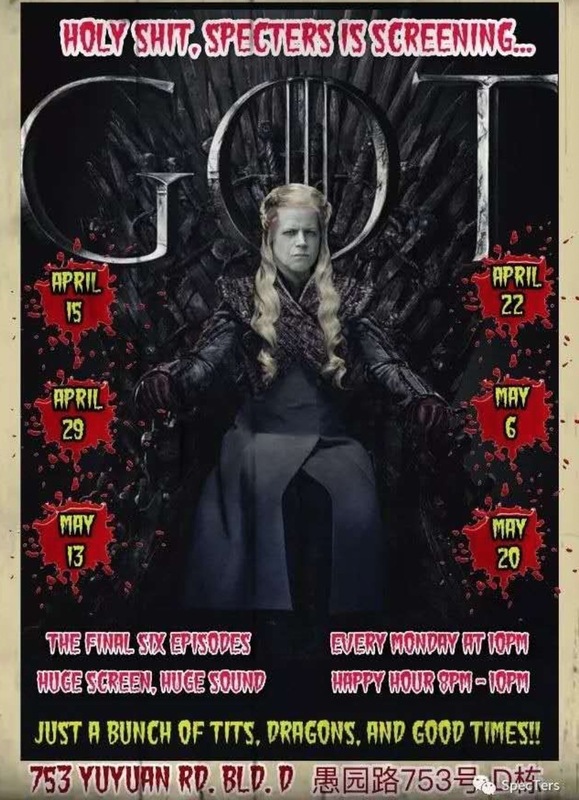 Night owls and Fireball guzzlers unite because Specters are doing a later showing of GoT every Monday from 10pm with happy hour deals from 8-10pm. Mondays April 15 - May 20, 8-10pm (happy hour), showing at 10pm. Specters, see event listing. Every Monday night, The Camel is showing the latest episode in the final season of Game of Thrones. Mondays Apr 8 - Jun 29. The Camel, see events listing. The Camel's sister bar The Hop Project showing the latest episode in the final season of Game of Thrones. Mondays starting Apr 8. The Hop Project, see event listing. When it’s not helping us find our find our next favorite restaurants, Bon App is busy organizing offline events for its user community. 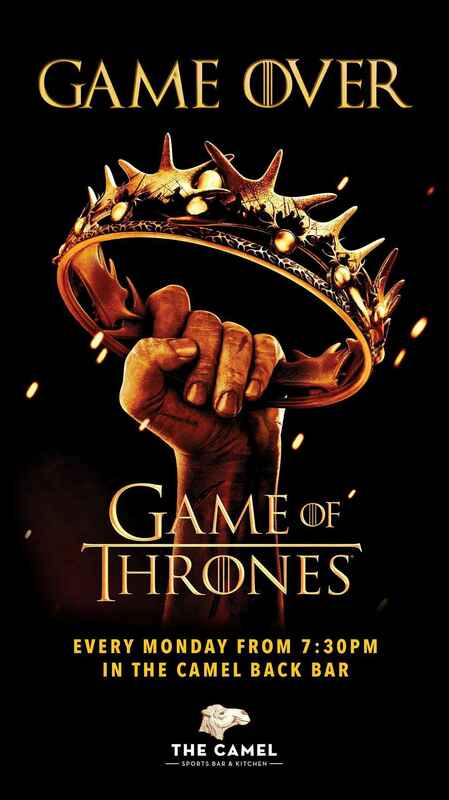 Every Monday at 7.30pm, from Apr 15 to May 20, Bon App will be hosting "Winter Has Come" Screening Parties, complete with quiz games and themed menus. Episodes 1 and 2 will be screened at The Beach House, episodes 3 and 4 at Raffle City’s Ocean Grounds, episodes 5 and 6 at The Pearl. Mondays Apr 15 - May 20, quizzes from 7.30pm, episodes from 8pm; RMB60 online, RMB100 at the door. The Beach House, Ocean Grounds, The Pearl, see event listing for chance to win free tickets. In addition to their partnership with Bon Connect, The Pearl will be running their own screening parties for all six episodes. Every week, they're also showing the previous episode at 7.30pm to ensure that you don't miss a beat. There will be free popcorn too, so you can enjoy the episodes in full movie-going style. Mon Apr 15 - May 6, previous episode 7.30pm, new episode 8:30pm, free entry. The Pearl, see event listing. Calling all fact-lovers from the Land Down Under.